Unique lot with great view. 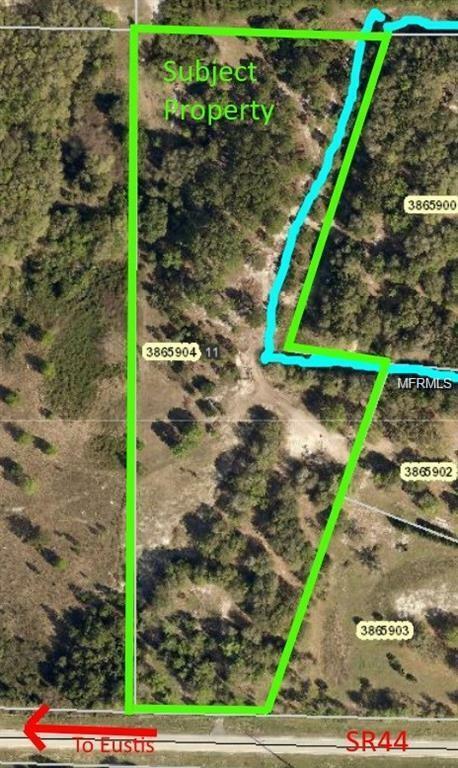 3 acres MOL of higher ground adjacent to SR44 overlooking 7 acres MOL of lower ground and a man-made linear pond along much of the eastern boundary of subject property. Only a little of the lower ground is wetlands with most just being flood zone that is perfect for grazing horses, ATV and private view. HOA was disbanded. There are deed restrictions against mobile homes. 2,400 sq ft minimum home size. Use any builder and build any time. Seller financing available on full price offer. Terms=85% financing @ 6% interest with 30 year amortization and 3 year balloon.Near Wekiva Parkway under construction. Less than 5 minutes from new Publix @ CR437 & SR44. Listing provided courtesy of Tree Frog Realty, Llc.